140 pages | 9 B/W Illus. 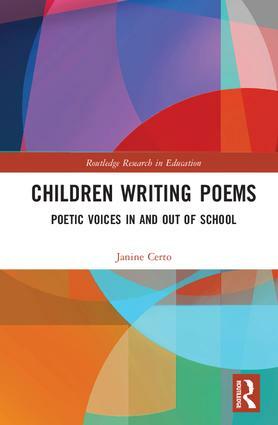 This volume demonstrates how the social and instructional worlds that children inhabit influence their poetry writing and performances. Drawing on rich vignettes of students from different racial, ethnic and linguistic backgrounds, it describes and analyzes the work of eight to ten-year-old U.S. students involved in a month-long poetry unit. Children Writing Poems outlines the value of a ‘poetic-functional’ approach to help children convey a poem’s meaning and mood, and expresses the need for educators to scaffold children’s oral readings and performances over time. Janine L. Certo is Associate Professor of Language and Literacy at Michigan State University, USA.